Ultra-high-definition televisions, also called "4K" sets, have been on the market less than two years but already make up at least 10 percent of revenue at Sony's TV business, its chief executive said Tuesday. The TV sets have a screen resolution four times that of today's best high-definition televisions and can display very sharp images when fed with 4K content, but first- and second-generation models are much more expensive than conventional TVs. Sony's current cheapest 4K television, a 55-inch model, costs US$3,000, and its most expensive set, an 84-inch model, costs $25,000. 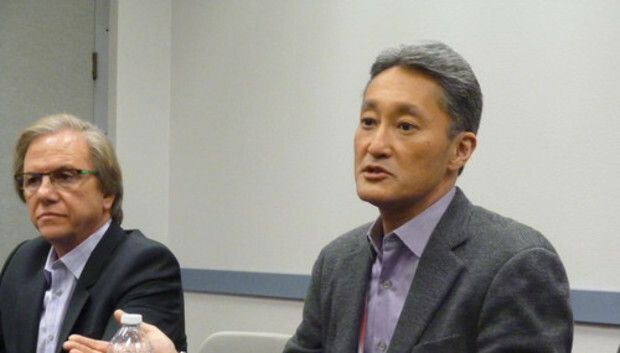 "The percentage in terms of [our] overall television business and how much of that is 4K is a very small percentage still," said Kaz Hirai, president and CEO of Sony, in a briefing with reporters at the International CES expo in Las Vegas. "However, because the average selling price of 4K televisions are a lot higher, they already are at least a double-digit percentage of our overall television revenue sales." For the period from July to September 2012, the most recent quarter for which details are available, Sony's TV business reported revenue of 174 billion yen (US$1.8 billion). That was up 18 percent on the same period a year earlier, although largely due to the impact of foreign exchange rates. "They are starting to become a very significant portion of our revenue and therefore the bottom-line contribution to the company," Hirai said. "But obviously, from a numbers perspective, the number of units going out the door, it's still single digits in a lot of territories." Sony and some of its competitors used this week's CES to launch new 4K televisions. The company's new 4K TV line-up, which will be available in the first half of 2014, includes nine models spanning three broad product ranges. Prices for the new TVs were not announced.